Remove ALL debris and water from pool cover before trying to remove cover. Remove any plugs from the skimmer and returns. doing a shock treatment might lighten it up so you can see shadows of the debris for easier removal. Turn pool on and ensure proper working condition of the equipment. Vacuum any settlement or sludge from the pool on waste. This will throw it onto the ground. Brush pool really well. All areas under water including skimmer and around all face plates. Shock your pool with the chemical you normally use for this task. Allow your pool to circulate over night. 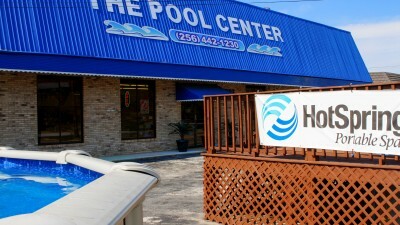 The next morning bring your pool water into The Pool Center where one of our trained technicians will help you get your pool ready for summer. CLEANING YOUR POOL REGULARLY IS THE KEY- Pay attention to your pool every 2 weeks! Skim pool surface of floating debris. Vacuum any debris from pool with your filter set on filter. If there is any settlement you do not want to go through your filter, you can vacuum with the filter set on waste. This will throw it out onto the ground. Brush your pool. The very best time to do this is either right before or right after your shock treatment, which should always be done after sundown in the evening using a pool brush NOT the vacuum head ! Clean your skim-line (bath tub ring). This is caused by body oils, hair spray, tanning products, etc.. from swimmers that can build up over time can become hard, or even impossible to remove. So adding this to your regular maintenance schedule can insure a beautiful liner for years to come. *ALWAYS use swimming pool compatible chemical, others can cloud your water. Empty your skimmer and pump baskets. this may need to be done more often because a full basket can starve your pump of water and cause it to burn out. Test your water balance and adjust accordingly. Inspect all equipment. early detection of a problem can save you money! Bring your pool/spa water to The Pool Center regularly so we can test your water and help you keep it clear, safe and fun.